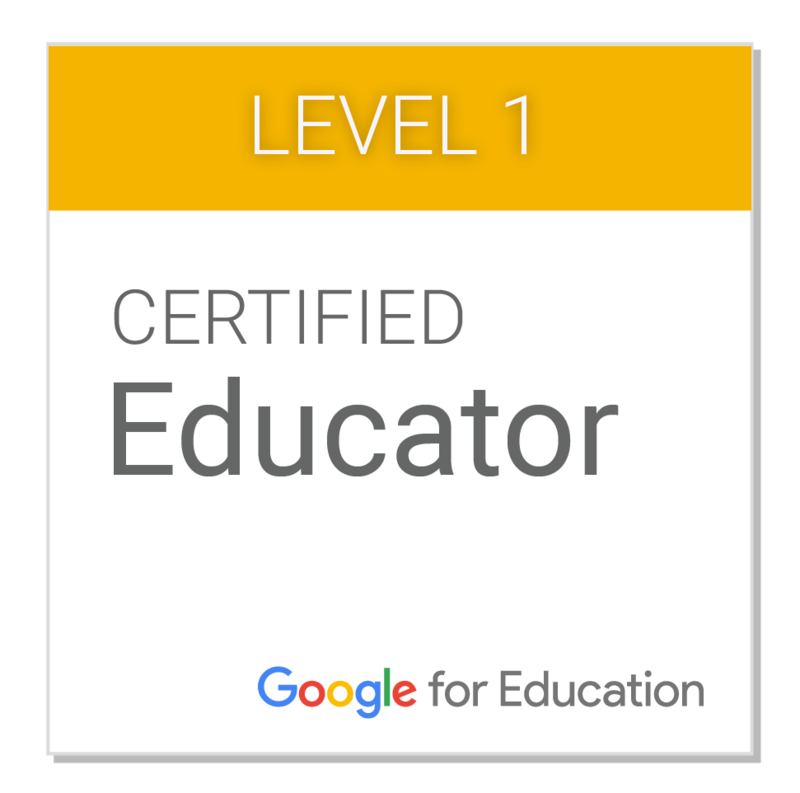 Over the break, I wanted to re-certify with Google Apps for Education. It took me back...to my first certification. Winter of 2011. I had received a gift of 25 new computers a few months earlier. I suffered from an infection. A few months earlier, I had read the words, "paperless classroom," in a blog somewhere. I wanted it. I wanted to use my new computers to take my teaching to a new level. I talked with my principal, and he agreed to pay for the certification. As it so happened, that winter had quite a few snow days. Every time school was canceled, I would get up, log into Gmail, and work toward certification. The promise of joining a motivated group of Google educators didn't work out quite the way I planned. I joined the Tennessee group of Google educators--and drove all the way to Memphis for one meeting--but I never really had any follow-up. I was able to do some trainings for teachers in my school and district. There was no "inside information" or learning network I got for being a Google Educator. I didn't get e-mails or previews of new products. It didn't help that the Tennessee group of Google teachers fizzled out shortly after my drive to Memphis. The last post in the group is dated February 1, 2012. The sole perk of certification was being a better teacher. It mattered to my students, which was all right by me. In five years of teaching with Google, I've learned a lot. I can guide people through the menu options of Gmail, Docs, and Slides over the phone without having a computer open. This fall I picked up Classroom and figured it out, teaching with it as an exclusive platform. Over Thanksgiving break, I got an "inside scoop" of sorts--a letter from Maria, a Google employee, engaging me and asking about my interest in certification and other Google programs. I wrote back about my previous experience as a certified teacher and asking her specific programs about how things worked now. Maria was very gracious, took the time to explain the levels of certification, and helped me to figure out that I'd like to work towards becoming a Certified Innovator, which would let me stay in the classroom, while trying out new teaching strategies and sharing ideas with other Google teachers. Maria's inquiry flipped my opinion of Google's educator services. I resolved to use a portion of my Christmas break to re-certify. Before her e-mail, I had posted a few questions in Google groups--basic stuff like "what do I do now?" Once Christmas was over, I had a few days to work on recertification. Google makes it easy to go through lessons at your own pace--you can skip straight to the section test if you want. I found myself working through the lessons, watching the embedded videos and recordings, and reviewing articles on apps that I didn't use often (Sheets). I picked up and applied lessons quickly. I had completely forgotten Google Groups, yet the lessons drew me in, and I quickly set up a group for my Model UN club to solve chronic communication challenges I have with that group. I intend to do the same for the two other clubs that I sponsor, Writers' Club and German Club. I also found some new features I hadn't known of. Slides is totally revitalized--moving toward a drag & drop format that reminds me a lot of blogs like Weebly. You can edit photos in Slides and Docs more thoroughly, using transparency to make remarkable backgrounds possible. Yet Research is now missing from the Tools menu. It doesn't take weeks or months for this educator to put new ideas to work. I put these lessons to use immediately in the lessons I planned for the first week of school. I had hoped to take the certification test the last free day of the break (Tuesday), but I was directed to wait 24 hours after I had paid the fee. That gave me the afternoon of my administrative day back at school to take the test. I made my copies, posted grades, and sat down to take the test around 2:40. Taking the certification test is a little intimidating. It requires that you have the computer camera on during the test--considering that I was still at school, I ended up getting up a couple of times without having trouble. It also shows that this is a certification exam that Google takes more seriously than the one I took in 2011, where it was pretty easy to look up answers that I didn't know. The test itself is really solid. The first part consists of multiple-choice, multiple-answer, and drag-and-drop questions that thoroughly look at how Google Apps can be used to solve problems that teachers face. The second part called on my to demonstrate use of every app in the portfolio--Docs, Slides, Sheets, Groups, Classroom, Forms, Sites. The directions were clear, and I really enjoyed this part, because the documents I produced proved that I knew what I was doing. The test took me about 2 1/2 hours, which is probably on the quicker end, considering the experience I had before I went through the training course. 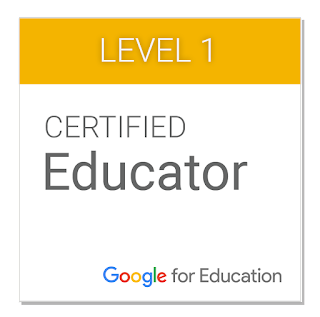 Within an hour or two of completing the exam, Google sent me a certificate and a badge, which I have included at the top of this blog. Our first day of school today coincided with a winter weather advisory. School got out two hours early. Kids are talking "snow day" for tomorrow. I don't really want one, but I will let you know, dear reader, that I have already signed up for Level 2 certification. When the snow days do come, I'll be ready--and looking forward to advancing toward Innovator status.